Technology development is directly impacting education and learning systems. With new technologies like machine learning and educational software the traditional educational methods as well as the role of educators are evolving. And so is the role of EO Browser, a free web application for browsing, comparing and analyzing various satellite datasources. 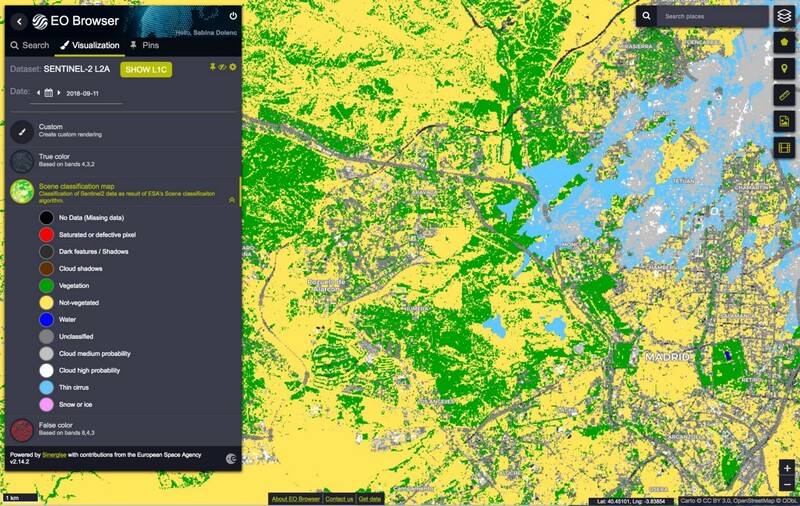 This useful tool for experts in remote sensing field is becoming more and more popular in teaching and engaging students with practical learning in Earth Observation (EO). Its development is strongly influenced by your experience and feedback, therefore new features are constantly being added. Enrolled in different educational activities such as ESA’s Teacher Workshops and presentations at various universities, EO Browser is being introduced to many teachers. These kinds of workshops are providing tools and practical ideas on how to run classroom lessons using space as a motivating context. Such activities inspired us to create a landing page with educational materials. Presentation of the Sentinel Hub to teachers at Charles University, Faculty of Science in Prague, Department of Applied Geoinformatics and Cartography (left). 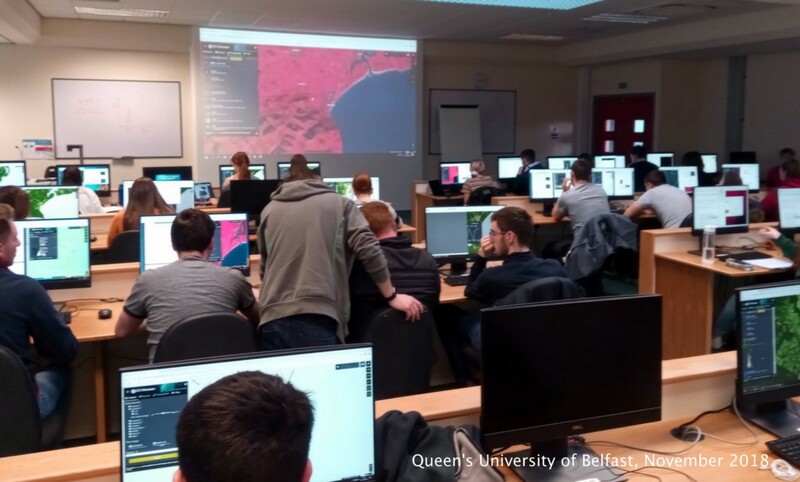 Presentation at Queen’s University of Belfast in November 2018 (right). In the spirit of spreading Earth Observation (EO) knowledge, we have created an educational page, which is meant to bring the possibilities of the EO field closer to anyone who would like to learn more about it. Here you will be able to find useful links and tools addressing various EO subjects in one place. Its already ready to use and will only grow over time. We have started with the use case dedicated to wildfires in hope to use the available material not just for educational purpose but for crisis management as well. We expect to include other cases such as agriculture monitoring, flooding, deforestation, ice melting, landslides, urban growth and similar in the near future. In connection to wildfires the satellite imagery is used for different purposes. Learn more about them in our Jupyter Notebook. For presenting different use cases we use Jupyter Notebook technology which has many benefits for scientific research. Since the documents contain a mixture of code and rich text elements, such as figures, links, equations, etc., they are ideal for bringing together an analysis description, its results and perform the data analysis in real time. 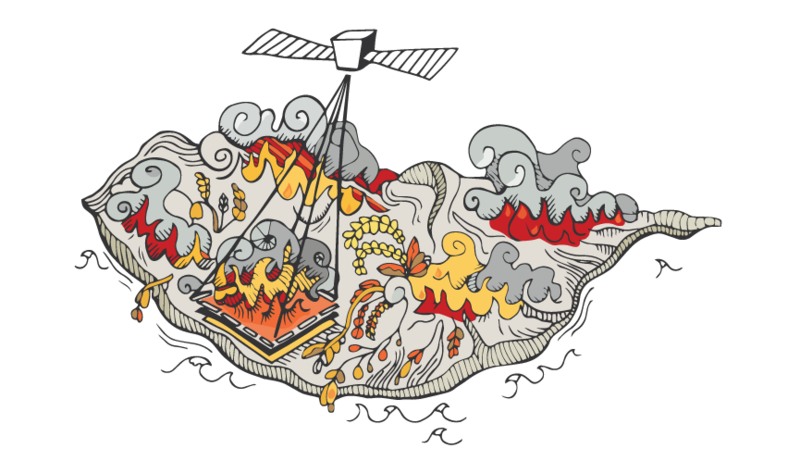 Jupyter Notebook devoted to wildfires will give you insight into several aspects of wildfires and their influence on the environment which can be observed from satellite images. E.g. 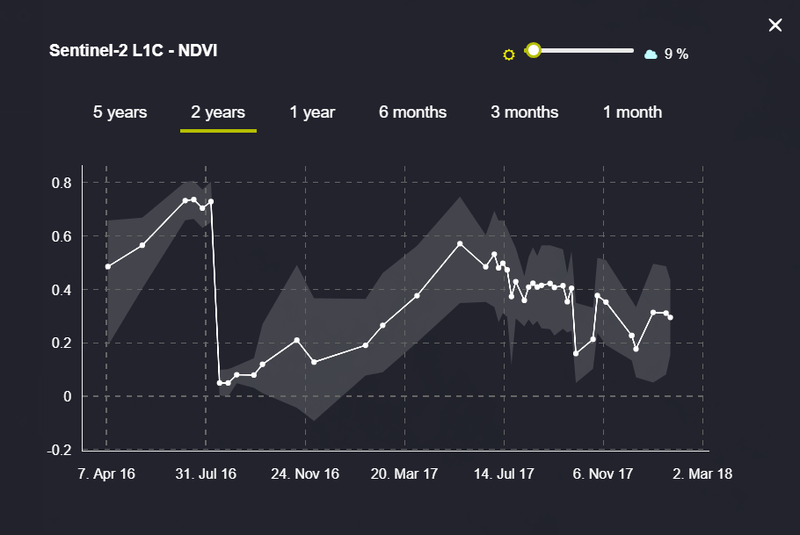 how to estimate the severity of damage that devastating wildfire left on vegetation by calculating the differences between NBR before and NBR after the wildfire. The wildfire severity map of Madeira, Portugal in July 2017. Explore it in Sentinel Playground. 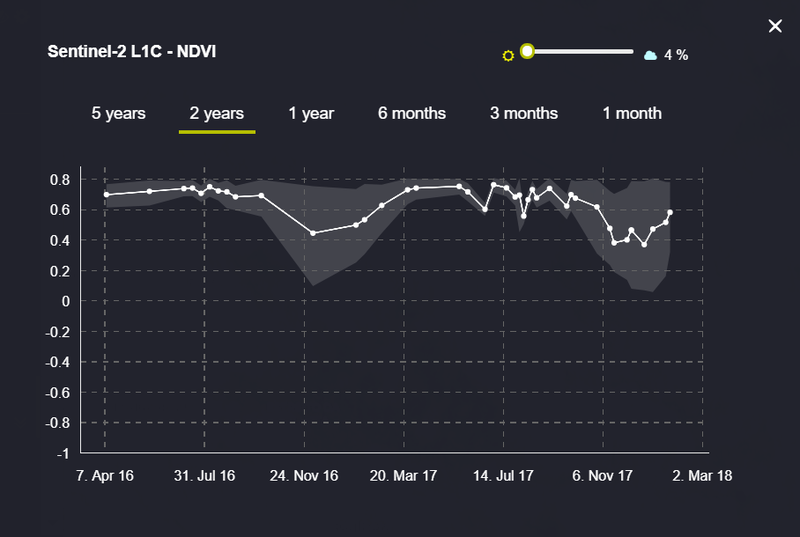 NDVI values of vegetation on unburned area (left) and on burned out area (right). Check the Jupyter Notebook for details! To speed up the process of extending the content of the educational page, we would like to encourage you to help us raise awareness about remote sensing by simply spreading the message or contributing as described here. Since our last blog on the upgrades of EO Browser in September, we have added several new features. First time visitors are now greeted with a welcome screen and step-by-step tutorial which guides you through all EO Browser features. You can access tutorial at any point in time by clicking the info (“i”) icon in the corner right up. We are in the process of preparing different examples of use cases. 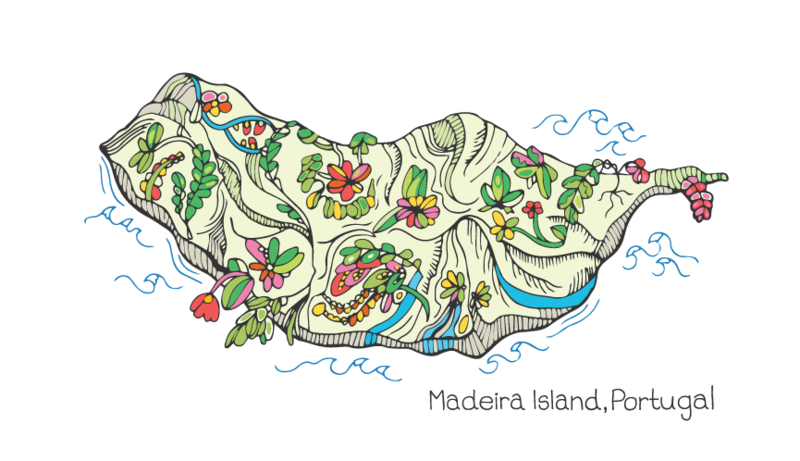 Currently available is a preset theme on wildfires, which includes read-only theme pins of the devastating wildfire in Madeira back in August 2016. Power users can now prepare a customized experience for the users which is intended for educational use. More on how to proceed with contributions will soon be published on our pages, but for now you can read a brief explanation on our forum. To already integrated Ozone, Nitrogen dioxide, Carbon monoxide, Aerosol and Cloud datasets, which include the global archive from the start of data availability, we have added the SO2 dataset. The data from Copernicus Sentinel-5P satellite show a range of trace gases that affect air quality. SO2 is a natural trace gas in Earth’s atmosphere which is mainly produced by the burning of fossil fuels by power plants and other industrial facilities. Besides, SO2 is injected into the atmosphere also with volcanic eruptions. 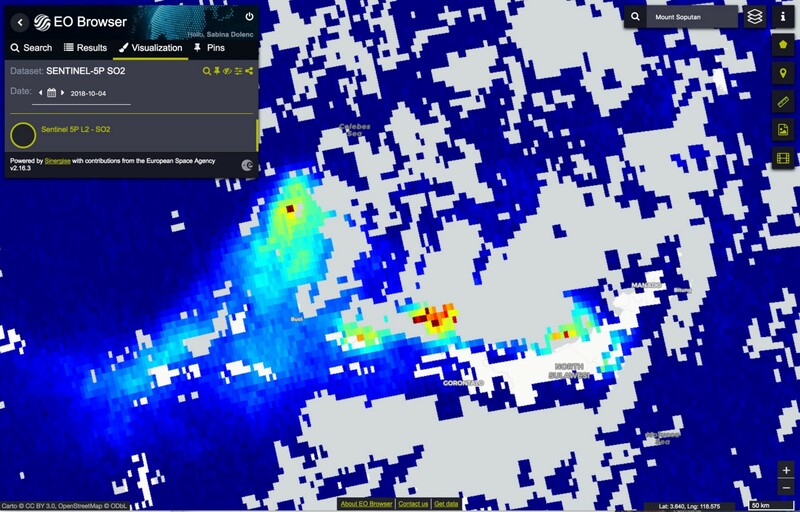 Traces of SO2 in the atmosphere after the Soputan’s eruption on the northern part of Sulawesi island (Sentinel-5P SO2, acquired on October 4, 2018 in EO Browser). In addition to Sentinel-1 datasource on the existing EO Cloud location, we have also added a datasource location on AWS. 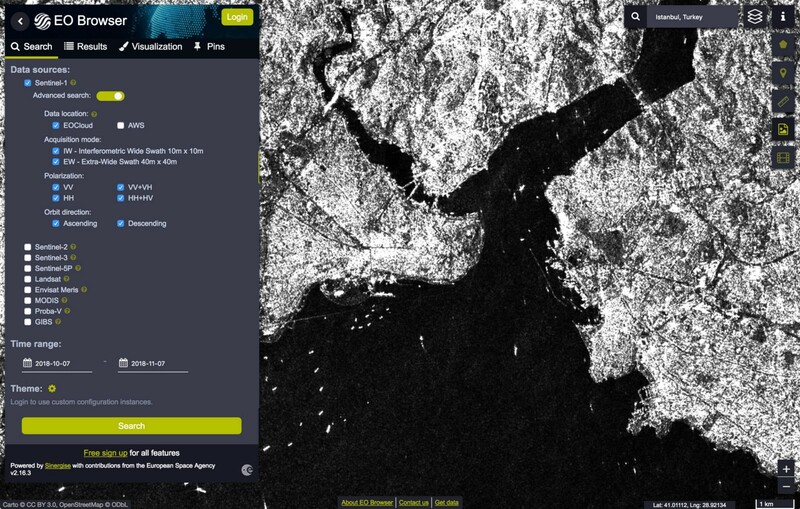 The overview of Istanbul, Turkey (Sentinel-1 GRD, acquired on November 5, 2018) showing the maritime traffic through Bosphorus canal. See it in EO Browser! For easier interpretation of the imagery and chosen products we have added the legends to some of the products directly accessible within the EO Browser (see images below). 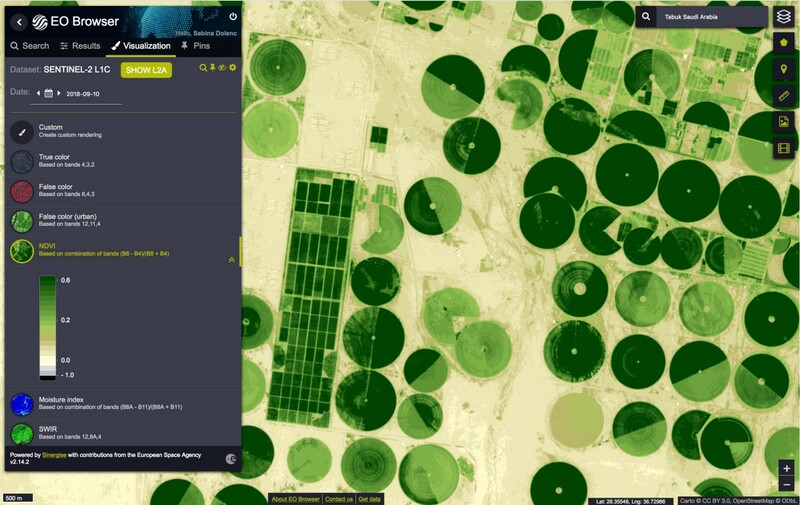 Examples of legends: image of Tabuk, Saudi Arabia (Sentinel-2 L1C, NDVI, acquired with EO Browser on September 10, 2018) — left, image of Madrid, Spain (Sentinel-2 L2A, Scene classification map, acquired with EO Browser on September 11, 2018) — right. Additionally, you can also add a legend to Sentinel-5P downloaded imagery. EO Browser now supports getLegendGraphics OGC WMS functionality on all services which support publishing legends. While using the Sentinel Hub services you are able to define custom legends on your own as well. To explore this possibility, follow the instructions! 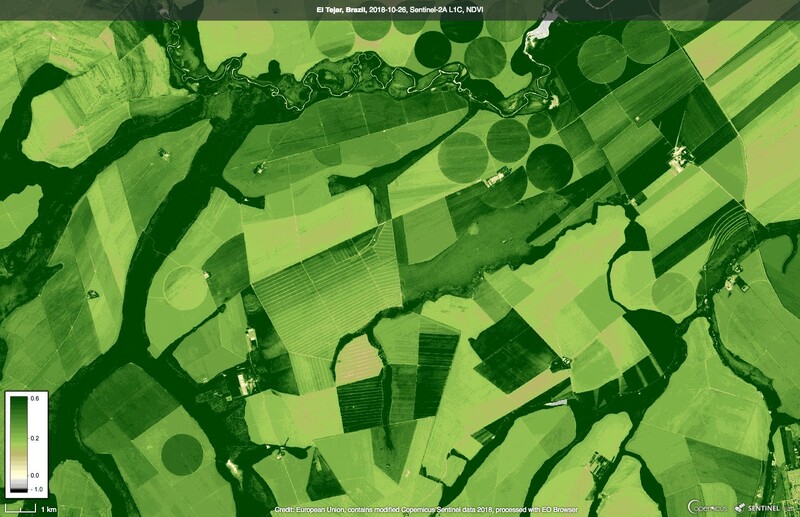 In the “Image download” panel under the “Basic” tab you simply need to enable “Show legend” option to include the legend on your downloaded image as above (El Tejar, Brazil — Sentinel-2 L1C, NDVI, acquired on October 26, 2018 in EO Browser). Many of registered EO Browser users were having a hard time searching their area of interest (AOI) on each visit over and over again. This came to an end with enabled option to save pins, which are now being saved on the server side. You are also able to reorder them outside of compare mode using a dedicated drag handle and rename them as well. Additionally to KML and KMZ upload, we now support the upload GPX and GeoJSON file to create an area of interest. The area will be afterwards used for clipping when you export the image. For easier workflow with the satellite data, we have enabled a possibility to add labels and overlays such as roads and political boundaries, which can be included on the downloaded images. If you would like to share the images with your friends and followers on Facebook and Twitter, simply use the newly added option of sharing by clicking the “share” icon. Don’t forget to tag us in the process (@sentinel_hub), so we can show it to with our followers too. 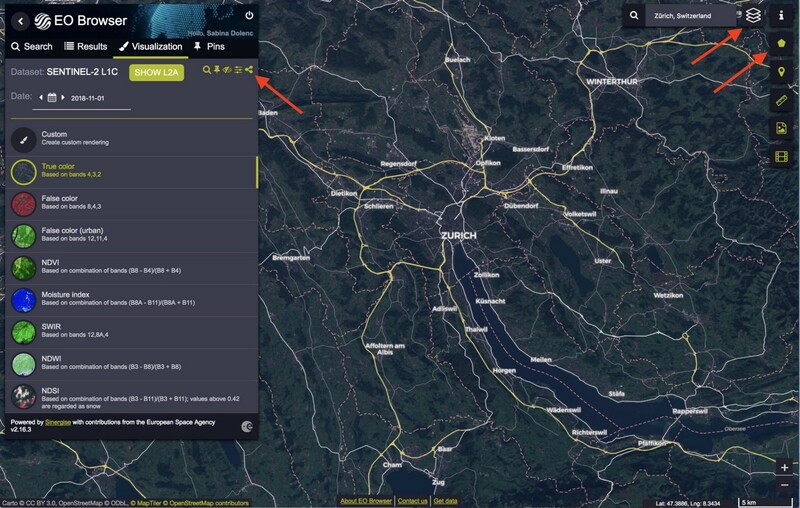 Zürich, Switzerland (Sentinel-2, acquired on November 1, 2018) — the image shows on the left the “share” icon and on the right the “labels” icon as well as the icon for uploading shape files. Try out the mentioned functionalities yourself in the EO Browser. EO Browser is a free web application. To access all features, you need an account which you can simply create here. If you have any feedback or suggestions, do not hesitate to let us know. We are also looking forward to your contributions to our educational page. Contact us if you have any questions or you need some help in the process of contributing.